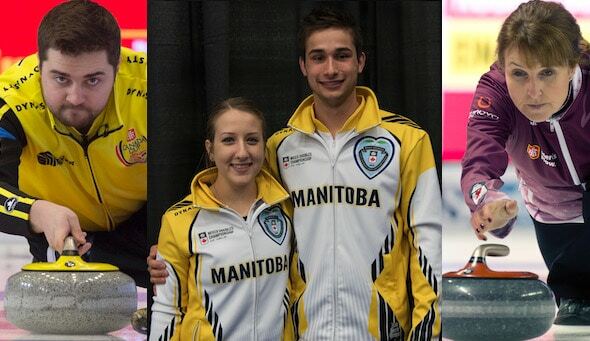 Matt Dunstone’s Regina men’s team (vice-skip Braeden Moskowy, second Catlin Schneider, lead Dustin Kidby), Darcy Robertson’s women’s team from Winnipeg (vice-skip Karen Klein, second Vanessa Foster, lead Theresa Cannon) and the Winnipeg mixed doubles tandem of Kadriana Sahaidak and Colton Lott all will be in action Wednesday at the Jököping Curling Club. 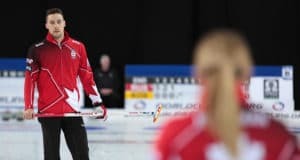 Team Dunstone and Team Robertson replaced Team Brad Gushue and Team Jennifer Jones in the Jököping field as a result of Gushue and Jones accepting invitations to the TSN All-Star Skins Game, which runs Friday to Sunday in Banff, Alta. The Dunstone and Robertson teams were the top teams on the Canadian Team Ranking System that had no conflicts with the Skins Game or provincial championships. Sahaidak and Lott, meanwhile, qualified as the runner-up team at the 2018 Canadian Mixed Doubles Championship. All teams will play a double round robin within their pools from Wednesday to Saturday. The top teams in each group move into the finals on Sunday. In addition to prize money, the winning teams will earn a berth to the Curling World Cup Grand Final, May 8-12 in Beijing. 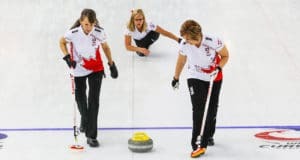 Team Robertson is grouped with reigning Olympic gold-medallist Anna Hasselborg, Russia’s Anna Sidorova and China’s Yilun Jiang. The other women’s pool consists of South Kora’s Minji Kim, Scotland’s Sophie Jackson, Japan’s Tori Koana and Cory Christensen of the United States. In men’s play, the Canadian team is in a pool with Norway’s Steffen Walstad, Scotland’s Ross Paterson and China’s Ziuyue Ma. World champ Niklas Edin, Yannick Schwaller of Switzerland, Korey Dropkin of the U.S. and Go Aoki comprise the other pool. Sahaidak and Lott are grouped with Swiss powerhouse Jenny Perret and Martin Rios (2018 world champs, Olympic silver-medallists) along with Sweden’s Camilla Noreen and Per Noreen and South Korea’s Hyeri Jang and Chiwon Choi. The other pool features Becca Hamilton and Matt Hamilton of the United States, Kristin Skaslien and Thomas Ulsrud of Norway, Maria Komarova and Daniil Goriachev of Russia and Cao Chang and Yuan Mingjie of China. Scott Pfeifer will be the coach of all three Canadian entries. The first leg of the Curling World Cup took place in Suzhou, China, in September. Canada’s Laura Crocker/Kirk Muyres and teams skipped by Rachel Homan and Kevin Koe won gold in mixed doubles, women’s and men’s respectively. All three teams have secured spots at the Grand Final. At the second leg, last month in Omaha, Neb., the three Canadian teams — Kalynn Park/John Morris in mixed doubles, Team Jason Gunnlaugson in men’s and Team Tracy Fleury in women’s — missed the playoffs. John Shuster’s U.S. men’s team, Satsuki Fujisawa’s Japanese women’s team and the Norwegian mixed doubles tandem of Skaslien and Magnus Nedregotten claimed gold medals in Omaha. View the full schedule and all teams competing at the second leg in Jököping by CLICKING HERE. 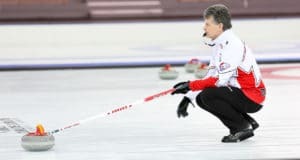 Selected games at the third leg of the Curling World Cup will be broadcast on the World Curling Federation’s YouTube channel.